Hard work of years paid back on 27 April 2018 for selected candidates when UPSC Civil Services Exam 2017 result came out. UPSC prepares the rank list of UPSC Civil Services Exam 2017 based on the total marks in the Main exam (written exam – out of 1750) and Interview Test (personality test – out of 275). Thus, the total marks are calculated out of 2025. Needless to say it is a grandeur moment for all those candidates who made it possible to imprint their name on the merit list. Every year UPSC results come out with plethora of inspiration where we realize that determined candidates’ fortitude finally overcomes all the struggle and even their sober backgrounds can’t distract them. This year too, the first three toppers recite a success story that is enough to bestow any aspirant with an exuberant impetus. The first topper is Hyderabad’s Anudeep Durishetty who has topped in 2017 Civil Services Exam. while Haryana’s Anu Kumari is second rank holder and topper among the female candidates while Sachin Gupta secured the overall third rank. Eight women have made it to the top 25 list. Durishetty belongs to other backward classes (OBC) category. He qualified the examination with Anthropology as his optional subject. He has graduated with B khE (Electronics and Instrumentation) degree from BITS, Pilani in Rajasthan. Meanwhile, Anu Kumari graduated with B.Sc (Hons) in Physics from Delhi University and has done MBA (Finance and Marketing) from IMT, Nagpur. In Durishetty’s very own words – “This was my fifth attempt. I have failed thrice before, and the journey was not easy for me, he told ANI. He unraveled a long journey of hard work succinctly in a single sentence. He used to study along with his job and didn’t take any coaching to prepare for the examination. The message to learn here is that the journey is same for everyone, but what creates the difference is patience, passion, propriety of disciplined life style and Positive Thinking. Anudeep is already a civil servant and is currently working as Assistant Commissioner at Indian Revenue Service (IRS), Government of India. 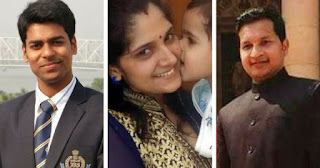 Anu Kumari, a mother of a four-year-old child secured the 2nd rank and is now an another exemplar for UPSC aspirants. She said she used to study 10-12 hours a day.This is like a dream come true. This feeling has still not sunk in. Thrashing all the hardships a woman can face in a married life, she never let her focus swayed and set an applauding hallmark for those aspirants who are always complaining and pretend to get crushed under encumbrance. Sachin Gupta, belonging to small trader family based in Sirsa town, ranked third in his third attempt. He is presently working as Assistant Director in the Ministry of Corporate Affairs. He said he was inspired to join the civil services by his father who is a farmer in Sirsa town. After completing school from DAV school in Sirsa, he completed Bachelor of Engineering in Mechanical Engineering from Thapar University, Patiala. If you are determined like concrete, no matter what your age is, and where you come from. Your past, your failures, your countless attempts, and even your destiny can’t stop you from creating a history…a history of Victory!! And best wishes to all the aspirants who are still waiting for this miracle to happen to clear any exam.